1. Wash hands well. After 6 months of age, if you are using a beaker it is not necessary to sterilise equipment, though you should ensure everything has been fully cleaned. If you are using a bottle and teat, sterilise all utensils according to manufacturers' instructions. 2. Boil 1 litre of fresh tap water. Allow boiled water to cool for no more than 30 minutes. Measure 180 ml (approx. 6 fl. oz) of water into a beaker or bottle, carefully - the water is hot. Do not use artificially softened or repeatedly boiled water. Using the scoop provided, add 6 scoops of powder, levelling off each scoop with the back of a clean dry knife. All babies are different but try to ensure that from 6 months to 1 year your baby has 500 - 600 ml of SMA® Pro Follow-on Milk per day, either as a drink, on cereals or mixed with food. Mix 1 scoop of powder to 30 ml (appro. 1 fl. oz) of water. We recommend preparing each feed in individual beakers/bottles when required. For hygienic reasons, discard unfinished feed in the beaker/bottle as soon as possible, and always within 2 hours. 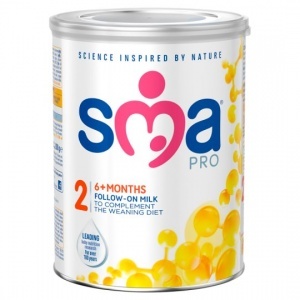 Made-up SMA Pro Follow-on Milk can be poured over cereals and mixed with food. Never add any food to the milk in your baby's beaker/bottle.